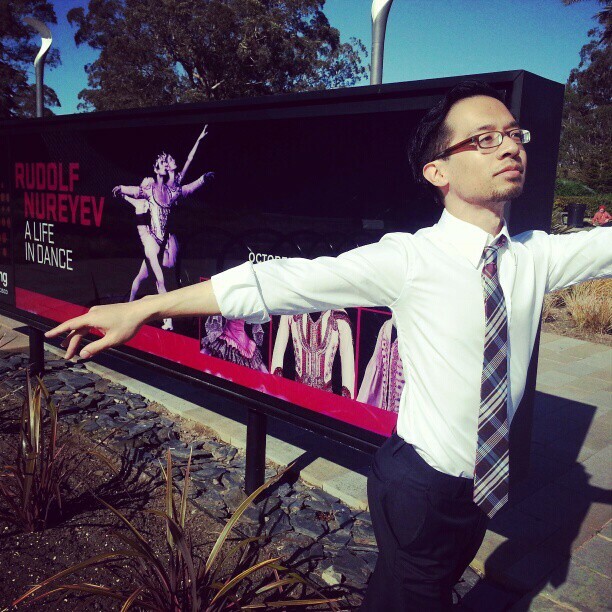 Jeté-ing my way to Nureyev at the de Young. Lots of beautiful costumes, photographs, and filmed ballet clips spanning Nureyev’s career await. Most of the exhibit is laid out in groups of costumes from various ballets, each backed by a small scrim that makes you feel like you’re walking backstage and onstage, as if wandering through several set pieces. As with most special exhibits, the taking of photographs is not allowed; otherwise you know I’d be snapping pics of every stitch and sequin! On your way out don’t forget to visit the textile room (just beyond the exhibit exit and store) for a small collection of photographs, news clippings, and a video produced by San Francisco Ballet, all relating to Nureyev’s connection to San Francisco. Did you clean out the gift shop? I’m currently carrying around my dissertation in my Nureyev bag 🙂 It’s a beautiful exhibition, didn’t you just love the use of the scrim and Bayadere shades clip!?! Gorgeous. Ooh, yes, I forgot in the blog post to tell everyone that the Nureyev items in the gift shop are now marked down (a lot). I didn’t quite clean out, but I did get a T-shirt and exhibition book. I would’ve loved if they had a mug. Souvenir mugs are my weakness, but I allow it since I do use them for my morning coffee, so it feels practical, haha. The exhibit is very cleverly put together. Yes, I was totally entranced!